Figure 1: The average charged-particle multiplicity per unit of rapidity for central tracks as a function of the centre-of-mass energy. The data are compared to various particle level MC predictions. The vertical error bars on the data represent the total measurement uncertainty. 29 July 2015, VIENNA: After a shutdown of more than two years, Run 2 of the Large Hadron Collider (LHC) has restarted with proton–proton collisions at a centre-of-mass energy of 13 TeV. This new phase will allow the LHC experiments to explore nature and probe the physical laws governing it at scales never reached before. The year 2015 began for the ATLAS experiment with an intense phase of commissioning using cosmic ray data and first proton–proton collisions allowing the ATLAS physicists to test the trigger and detector systems as well as to align the tracking devices. 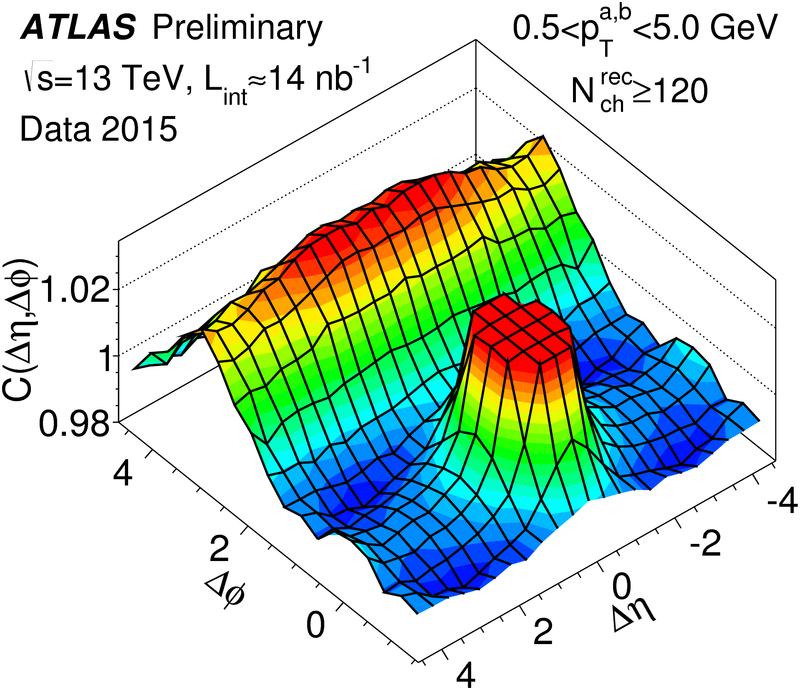 First data in so-called "stable-beam" conditions, required for physics analysis, were recorded on 3 June 2015. An important early goal of the experiment was to record roughly 200 million inelastic proton–proton collisions with a very low level of secondary collisions within the same event (so-called "pile-up"). This data sample allowed ATLAS physicists to perform detailed studies of the tracking system, which features a new detector, the Insertable B-layer (IBL). The IBL consists of a layer of millions of tiny silicon pixels mounted in the innermost heart of ATLAS at a distance of 3.3cm from the proton beam. Together with the other tracking layers of the ATLAS detector, the IBL allows ATLAS to measure the origin of charged particles with up to twice better precision than during the previous run. Figure 2: Two-particle correlations in events with low multiplicity, 10120 (right panel), of produced particles. The right plot shows long-range correlations (ridge) along the Δη axis at ΔΦ ˜0. The early 13 TeV data sample was exploited for important physics measurements. It allowed ATLAS to characterise inelastic proton–proton collisions in terms of charged particle production and the structure of the so-called "underlying event" — collision remnants that are not directly related to the colliding partons in the proton. This characterisation is important for the validation of the simulation of the high-luminosity LHC collisions which contain up to 40 inelastic proton–proton collisions in a given event. An event involves the crossing of two proton bunches with more than 100 billion protons each. The measured average charged particle multiplicity as a function of the proton–proton collision energy is shown in Figure 1. ATLAS physicists also measured the angular correlation among pairs of the produced charged particles, confirming the appearance of a so-called "ridge" phenomenon in events with large particle multiplicity at a centre-of-mass energy of 13 TeV. The "ridge" consists of long-range particle–particle correlations not predicted by any of the established theoretical models describing inelastic proton–proton collisions. The ridge is shown in Figure 2. ATLAS has exploited the data to perform important early measurements. The excellent detector performance has allowed the confirmation of theoretical expectations with 13 TeV proton–proton collision energies. After the low-luminosity phase, the LHC began to increase the intensity of the beams. 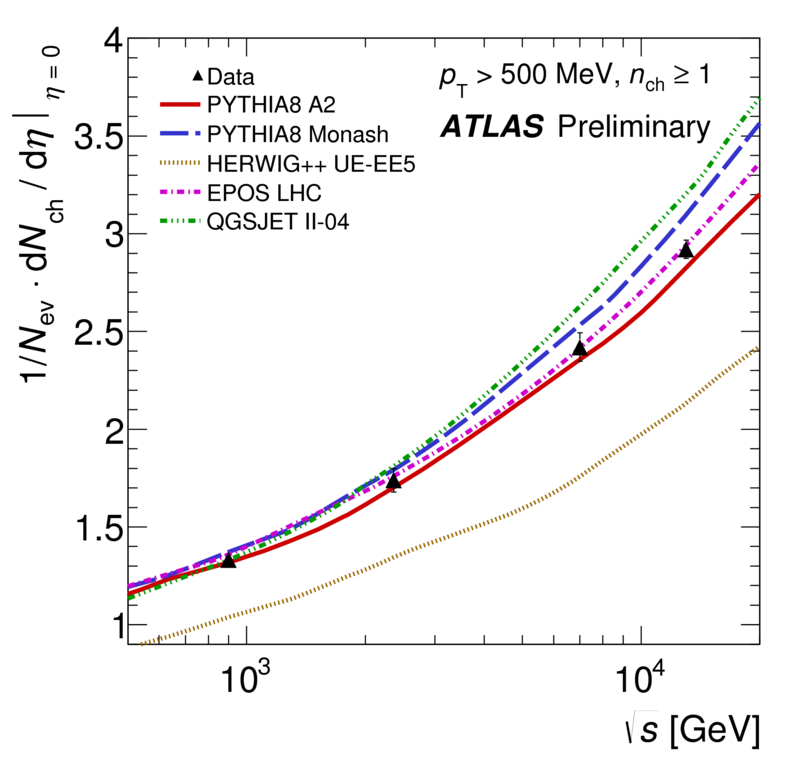 A total luminosity of 100 pb–1 was recorded by ATLAS by the time of the EPS-HEP conference, of which up to 85 pb–1 could be exploited for physics and performance studies. ATLAS physicists measured the performance of electron-, muon- and tau-lepton reconstruction, the reconstruction and energy calibration of jets, and the reconstruction of "displaced" decays of long-lived particles such as weakly decaying hadrons containing a bottom quark. The precision of the position measurements of displaced decay locations, called vertices, is significantly improved by the new IBL detector. Figure 3: Dilepton mass distribution after the Z→ μ+μ- selection. The expected contributions from signal and all backgrounds are estimated with Monte Carlo simulations. 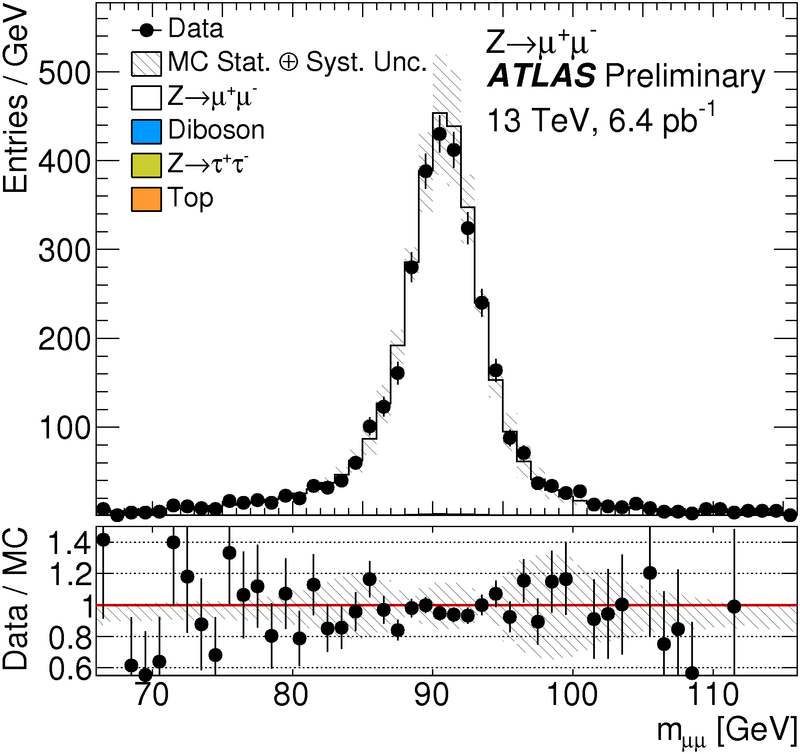 ATLAS used these data to classify the production of J/Ψ particles at 13 TeV in terms of their immediate ("prompt") and delayed ("non-prompt") origin. While the non-prompt J/Ψ production is believed to be well understood via the decay of b-hadrons, prompt production continues to be mysterious in some aspects. ATLAS also performed a first study of the production of energetic, isolated photons and a first cross-section measurement of inclusive jet production in 13 TeV proton–proton collisions. Both are correctly described by state-of-the-art theory. The data samples at high collision energy contain copious numbers of Z and W bosons, the mediators of the weak interaction, whose leptonic decays provide a clean signature in the detector that can be exploited for calibration purposes. ATLAS has studied the kinematic properties of these bosons, also in association with jet production. Their abundance in 13 TeV proton–proton collisions is found to be consistent with the expectation from theory. The Z-boson mass peak, reconstructed in muon pair events, is shown in Figure 3. Figure 4: The new result at 13 TeV (red circle) is compared to previous results from ATLAS using the same analysis techniques (blue points) and the most precise measurement fr: the top-antitop production cross-section as a function of the centre-of-mass energy. ATLAS has also observed some rare di-boson (ZZ) events, which – with hundred times more data – should allow the direct detection of Higgs-bosons. In higher energy collisions the rate of particle production for a given luminosity increases, and the rise for heavier particles is even more pronounced. The heaviest known particle, the top quark, has a mass equivalent to that of a gold atom or approximately 170 times that of a proton. It is predominantly produced in pairs at the LHC, and the cross-section of top-quark pair production is expected to increase by a factor of 3.3 at 13 TeV compared to the Run-1 8 TeV collisions. 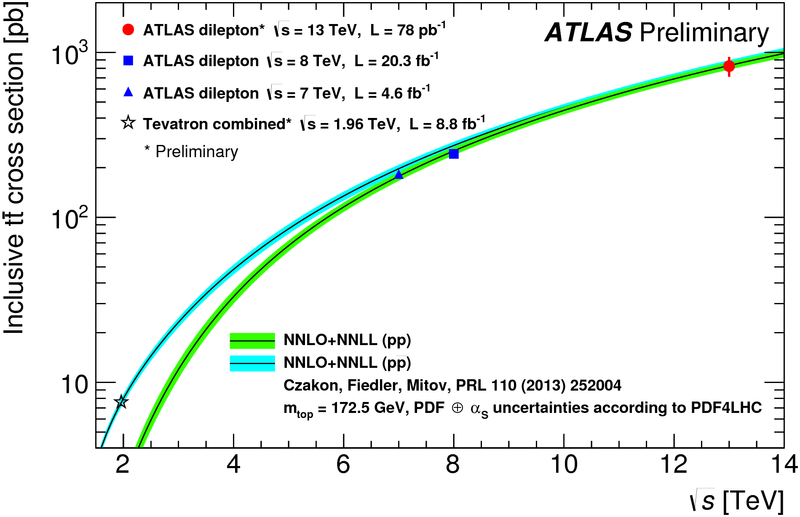 ATLAS has performed an early measurement of the top-quark pair production cross-section in the cleanest channels where one top-quark decays to an electron, an electron-neutrino and a jet containing a b-hadron ("b-jet"), and the other top-quark decays to a muon a muon-neutrino and a b-jet. The small backgrounds from other processes in this channel allow a robust measurement with small systematic uncertainties. The measured cross-section agrees with the predicted factor of 3.3. The precision of the measurement is limited by the 9% luminosity uncertainty, which is expected to significantly improve during the year 2015. The top quark pair production cross-section is shown in Figure 4. Although the available data sample does not yet allow the sensitivity to the most prominent new physics phenomena to be significantly increased, ATLAS has exploited the data to perform important early measurements. The excellent detector performance has allowed the confirmation of theoretical expectations with 13 TeV proton–proton collision energies.